I have sat through many a talk from visiting speakers; none have had the impact that Matthew had when he visited Hathershaw. One of Naz and Matt Foundation’s core objectives is to raise awareness and provide educational support to schools who are addressing and tackling homophobic bullying and homophobia triggered by religion or culture within their school and wider community. Since Naz and Matt Foundation started in 2014, we have delivered numerous talks at schools across the UK, including London, Birmingham, Oldham, York, Bradford and Leeds with more planned. Feedback from teachers and students has been very positive and due to demand we now have a waiting list of schools who have requested a talk. 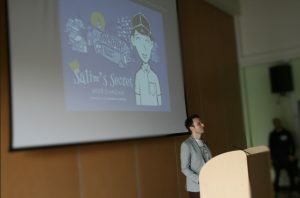 The talks are specifically designed for schools and provide a powerful platform that encourages conversation and dialogue within schools, leading to increased understanding and acceptance that individuals are born gay, lesbian, bi-sexual, trans, queer, questioning or intersex (LGBTQI+) within their local community. Our main priority is to work with schools in areas that have a high concentration of families practicing religion that may be impacting the happiness or wellbeing of children that are LGBTQI+. The format of our talk includes the screening of a short film produced by Naz and Matt Foundation, along with media clips, a visual two-way presentation to students, followed by a Q&A session at the end. During the session our personal and tragic story is shared, ending with a positive message that students can take back to their classroom for further discussion with their teachers. 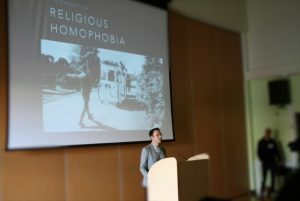 Our goal is to connect the hearts and minds of students, by showing the real-life impact that homophobia (triggered by religious and cultural beliefs) can have if not recognised and tackled. Read more about our story, and why Naz and Matt Foundation had to be created. What has been the reaction from students? Feedback has been positive and encouraging. Students often stay back after the talk to ask questions. Teachers are encouraged to continue the conversation back in the their classrooms and future assemblies and be prepared to provide support if necessary. Below is some feedback from a student who attended one of our talks in West Yorkshire in 2016. What has been the reaction from teachers? An incredible assembly, which both captivated and moved our year 9s and our Sixth formers. Matt’s courage was an inspiration to them all, and many spoke of his bravery at speaking to strangers of his love and loss. The assembly also led to a sea change in attitude at a follow up PSHE lesson where many showed maturity and tolerance towards issues raised as part of LGBTQI week that they had not shown before. Thank you Matt for sharing your story. The talk that Matt delivered was extremely powerful. We are a very diverse school and many of our pupils experience pressure from their families regarding marriage and potential partners. The talk empowered many of them to question what is going on in the Asian society around our area and inspired them to try and make a difference to the situation. 98% of the students said they had learnt something from the session. Many students felt able to discuss a topic they may have not previously felt comfortable with. It touched a lot of our students emotionally, and allowed them to debate their viewpoints with other students. Not only was it informative, it was a topic they were eager to discuss even days later. We do not charge for this service, but we do kindly ask schools to pay our direct costs (such as travel and accommodation – if necessary) and consider a donation to our charity. Our Foundation is funded by the generosity of the families and general public that donate to us. We receive no government funding. How can my school request a visit? Please click the ‘Request school visit’ button below and complete all questions on the form. One of our team will review your request as soon as possible and get back to you. We encourage schools to partner with other schools in their local area to reduce costs. We are then usually able to speak to up to three schools in your area on the same day.